Bye, Bye Summer. Hello, Pomegranates! I sure was disappointed last week when I bit into a peach I had purchased at the grocery store. No flavor. The opposite of juicy. No bueno. It made me sad . . . summer fruit is going bye bye. Sweet, juicy peaches, tart plums, tangy nectarines . . . so long . . . at least until next summer. As I was mourning the imminent departure of summer’s natural yumminess, I glanced out my kitchen window. And smiled. The mourning quickly subsided and I felt a sudden pang of happiness! There it was in the middle of my backyard: a young, small pomegranate tree bearing its jewel-like fruit for the first time. I planted the little seedling of a tree over two years ago. I wasn’t even sure if it would survive. I planted it right in the middle of the yard (where a mature fig tree had once grown) and simply left it alone in the California sunshine. I had high hopes. You see, I have a special relationship with pomegranates. 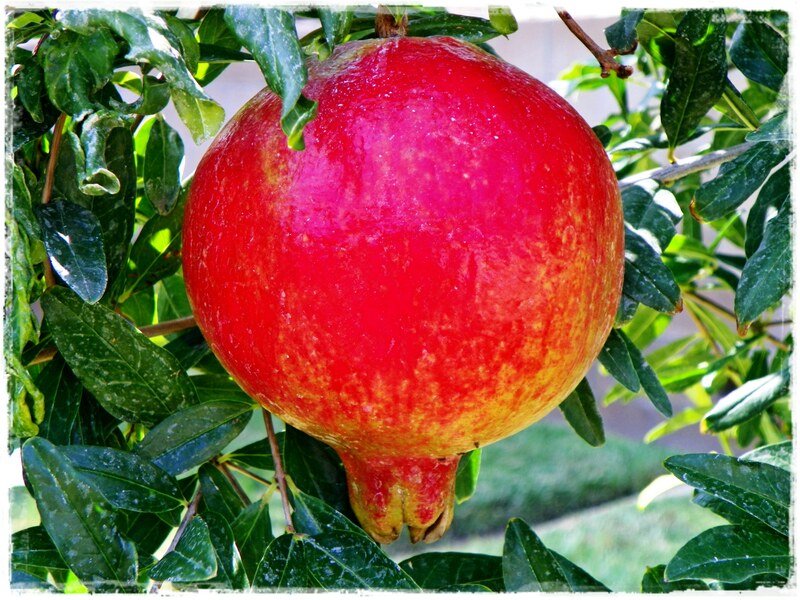 When I was growing up, our family had a pomegranate tree.The thought of that big ol’ pomegranate tree on the side of my house brings up such great memories. I remember sitting on the curb on my tree-lined street as a young girl with my besties, Nancy and Debbie, barefoot, wearing shorts and a pom-stained shirt, breaking pomegranates on the street and happily sucking the seeds out. I remember back in the day my Mom would actually give out fresh picked pomegranates for Halloween. Kids came from far and wide to get one. Of course, this was before the “razor blades in apples” and pot-laced candy scares. And I remember my Dad’s homemade pomegranate jelly. Who even does that anymore? Do you know how much work it takes to get enough juice out of those suckers to make a batch of pomegranate jelly? A beautiful pomegranate on my very own tree! Turns out my son, Garrett, loves pomegranates, too. 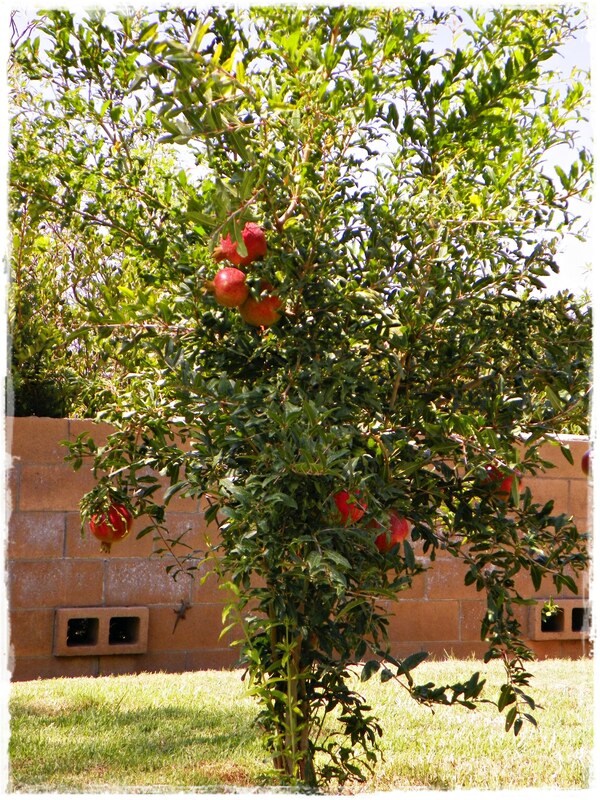 So for many years Garrett and I would beg friends and neighbors with trees for some of their fruit. We even used to drive around looking for pomegranate trees. We’d pull over in front on some stranger’s house, go to the door (I hoped that having little Garrett with me would make it easier for people to say yes to sharing) and ask if we could relieve their tree, heavy with fruit, of some of the delicious round globes. Most of the time people would say, “Yes, of course! Help yourselves!” But once, a grumpy woman actually said no. She claimed that she had promised the pomegranates already to someone else. I remember thinking, “Really? All of those pomegranates have been promised to someone else? What is someone going to do with hundreds of pomegranates? Well, they must be making jelly.” Garrett and I skulked away. The worst part was that we drove by that house twice a day every day on the way to Garrett’s school. No one ever harvested those pomegranates. Not a single one. And they rotted. And they fell to the ground. Wasted. We were heartbroken. So I decided get a tree. Luckily for me, our local public utility company has a program that provides free shade trees to customers every Spring. Each March, the City of Riverside puts a coupon on the back of everyone’s utility bill. All you have to do is take the bill with the coupon to a participating nursery and redeem it for one free, qualifying shade tree. It’s a very popular program here in Riverside that has provided more than 117,000 free shade trees to residents over the years. It’s a successful program all around–the trees help to beautify the community while providing energy savings by offsetting summer cooling costs. I sound like a commercial. Anyway, I got a free tiny little pomegranate tree. In about 3 weeks, I’ll be harvesting my first crop of pomegranates. 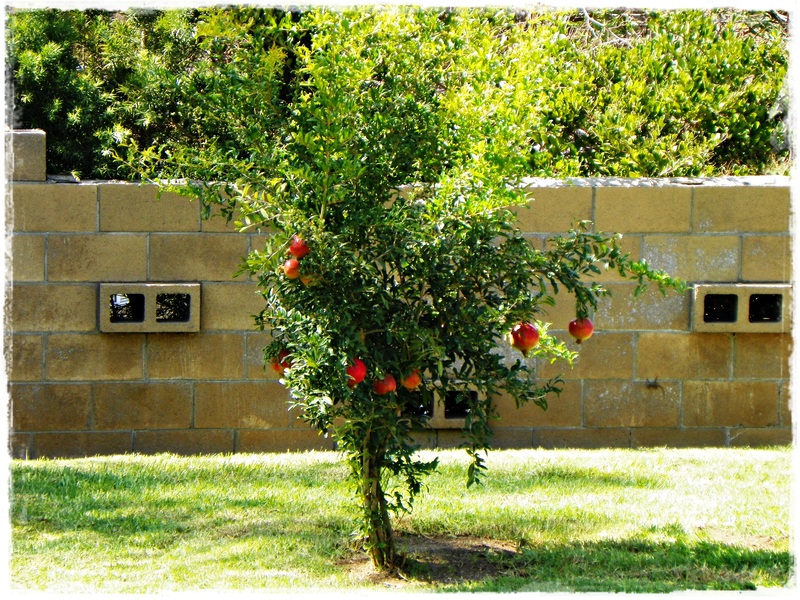 I think there are about 10 pomegranates on the tree. Can I call 10 pomegranates a crop? And I shouldn’t forget about the limes. Limes are another Fall/Winter fruit that always makes me happy. 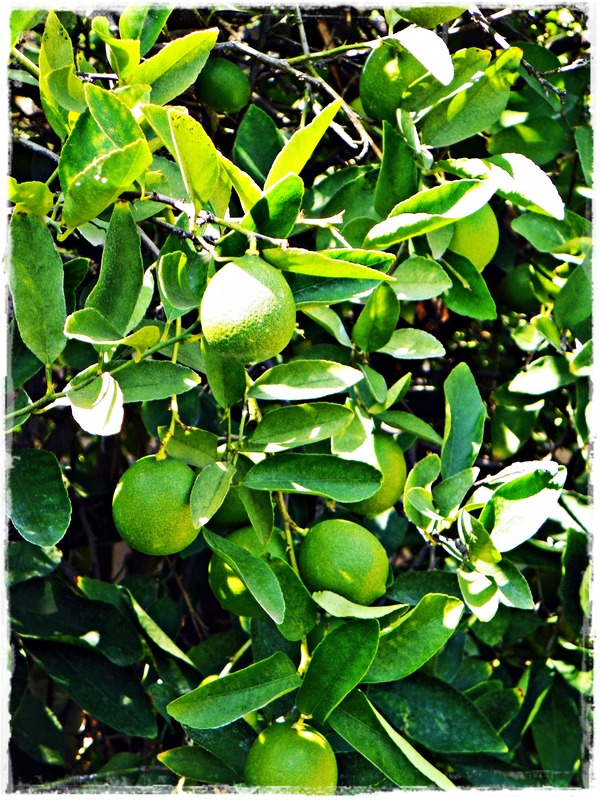 My lime tree is seriously loaded this year. Anyone need limes? Okay, so I’m not so broken up about the end of Summer, after all. I’m SO excited that your ‘free tree’ is bearing fruit already! I know how much you love them, and I’ve been happy to share some of my crop with you over the years. Yay City of Riverside! Just ran out and checked my pomegranate tree – no fruit yet – only a year old so here’s hoping for next fall. 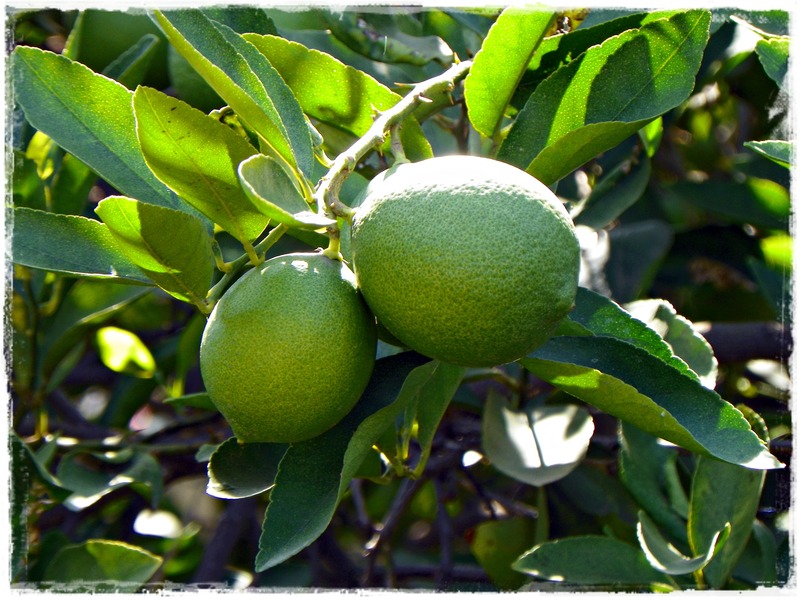 Would love some limes – my lime & Meyer lemon trees have stopped producing 😦 Will have to do some serious feeding & watering to nurse them back to health, I’m thinking. We had a tree at my childhood home and my grandmother would make jelly for us. a few tears ago I mentioned it at a family fathering and since then my aunt has made me pomegranate jelly every year for Christmas. I get about 6 jars which last the year. It’s something I look forward to every December now. Love that, Rory! Maybe in a couple of years I’ll have enough poms on my tree to try making a batch! My mom used to make pomegranate jelly! I remember her putting waxed paper all around the kitchen to keep the juice from staining the counter tops. Good memories. My sisters were wild about pomegranates. If you decide to make jelly, you have to give me some. I’ll even help you! And I wouldn’t mind a couple of limes.